Bank of Baroda is India's International Bank having its presence in almost 25 countries worldwide for the past 100 years. It has over 5500 branches worldwide with head office in Baroda, India. If you have an account in this prestigious bank and need to visit your Bank of Baroda branch for any banking requirement. Then, you must know the working timing of the bank along with the lunch or any other breaks in between so that you visit your Bank of Baroda branch when it is open and finish your banking requirement faster. If you are also looking for Bank of Baroda working hours & Lunch time then read on. 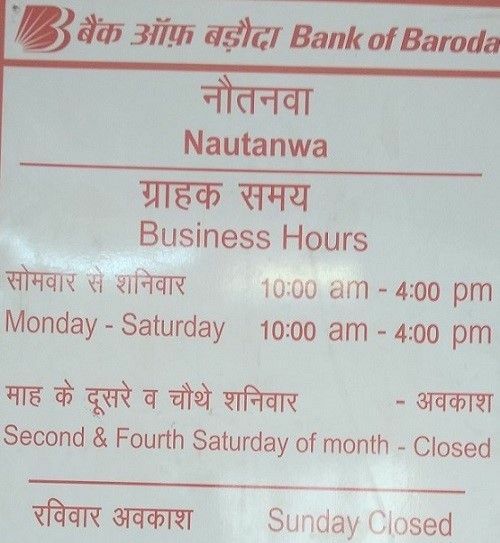 Bank of Baroda is open all weekdays except holidays declared by Indian Government for banks in India. You can visit any day during weekdays from Monday to Friday from 10 a.m. in the morning to 4 p.m. in the evening. The Lunch Time during weekdays is from 1 p.m. to 2 p.m. and there is also tea break from 3.00 p.m. to 3:15 p.m.
Bank of Baroda works 6 days a week so every Sunday is the off day along with the second and fourth Saturday (which are declared off days as per the Government Of India). Apart from that first, third and fifth (if any month has 5th Saturday) Saturday is working days for the bank. The employee declined to deposit money at 4:05 in the evening. Having all accounts in Bank of Baroda. Now closing all accounts as soon as possible. I visited Baroda Rajasthan Kshetriya Gramin Bank Moti chouk ,Sardarshahr at 3:58 PM to deposite a sum of 6000 INR.I filled the slip and stood before the cash window ..the Madam who was on duty entered the chamber and informed that depositing the amount is now close ..It was 4:02 Pm when she informed me ..then I asked " is it not till 5 pm??? " The another one who was sitting beside her told that no " trasaction timings is upto 3:30 pm "
banks person not do their duty till 5 pm. i also know that they only 3 and 30 pm duty. This bank of Baroda mukono branch has very poor services...the ATM is always faulty and with no money...this is a great disservice to some of us.